There are various different types of liver diseases and they can be caused in a number of different ways for example Hepatitis C, Liver Cancer, Cirrhosis, NAFLD non-alcoholic fatty liver disease, fatty Liver are just a few types of liver diseases. In a lot of cases the liver is often ignored, neglected whilst being continuously overworked and overloaded most commonly by drinking excessive alcohol, eating unhealthy processed foods and other vices such as smoke and or drugs. This type of neglect of the liver can initially cause a minor liver problem such as Fatty Liver for example and if neglect continues it can transform and evolve over time into something much more serious over time such as Cirrhosis or Liver Cancer. Watch out if you notice changes in the color of your urine to a darkish brown/orange colour. and or yellowing the whites in your eyes. If you notice these things book an appointment and get it checked out with your GP. If you notice these things, you can also do certain things to help your liver by going organic and staying away from processed foods, even pasta is a processed food. By following this advice you immediately take a lot of the workload off from your liver, because your liver does the hard work by processing nutrients correctly and filtering out pesticides and toxins from the types of food and drink you consume. However going organic can end up being a hassle at first to shop for and time consuming to prepare every single day. So a result you may be eating healthy some-days when you have the energy to prepare something and not so healthy on other days. 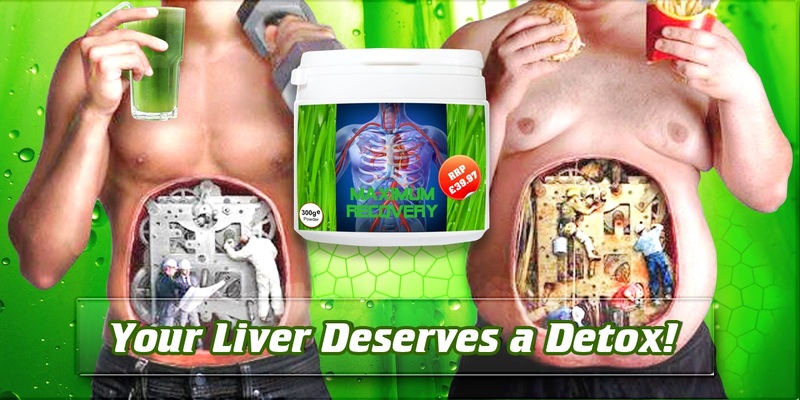 If you want to help you liver then Maximum Recovery is an excellent product to consider as it contains 35 super-foods that are good for your liver in a blended powder form, all you need to do is add a scoop to water and have it as a drink... best of all it takes less than 30 seconds. Your liver loves water and craves it in order to stay hydrated, therefore when water is mixed with 35 liver cleansing super-foods.... it becomes a no brainier that Maximum Recovery is one of the best treats you can give your liver... No mess, no fuss and no hassle. Click here to checkout Maximum Recovery. Or alternatively another good option is to learn about the specific ingredients yourself so you can shop for and blend your own, Click here for a list of foods that are good for the liver.